Rachel Neylan and Rossella Ratto will both be riding for Hitec Products in 2013, the Norwegian team has announced. Both riders were part of the race winning break at the World championships in Valkenberg, Netherlands, last month, with Australian Neylan taking the silver medal behind Dutchwoman Marianne Vos. Italian Ratto - who, at 18 years of age has just completed her first year in the elite peloton - was unable to follow Vos’ acceleration on the penultimate lap, but managed to hold off the chasing peloton to take sixth place. 30-year-old Neylan has experienced a successful 2012, despite experiencing issues with her Abus-Nutrixxion team. Her biggest results came at the Exergy Tour, where she finished 11th overall, and at the Tour de l’Ardèche, where she finished fourth overall while riding as part of a mixed team that included race winner Emma Pooley. Undoubtedly, her best race of the year came in Valkenberg however, where she took Australia’s first medal since Oenone Wood’s bronze of 2005. 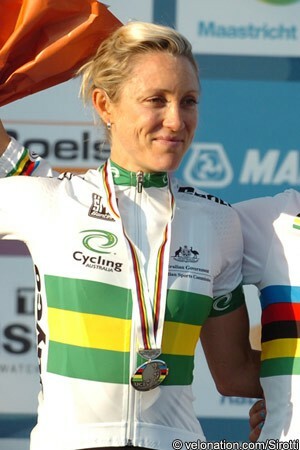 Ratto spent the 2010 and 2011 seasons as one of the outstanding junior riders in the World, and was European road and time trial champion in 2011; she was just unable to translate her talent to Worlds glory however, but took a silver medal in 2010. A first senior season, as part of a Verinlegno-Fabiano team that was built around her, has seen Ratto take a number of big results - including fifth in the Giro del Trentino, 14th in the Giro Donne, and seventh in the Giro della Toscana - and she finished the year ranked 35th in the World. Both riders will go some way to replace Swedish champion Emma Johansson, who will leave the team after two years, and will join Cecilie Gotaas Johnsen, who was confirmed as joining the team in August. Ratto will have Italian company in the team with Elisa Longo Borghini, who was also part of the World championship winning move, and took bronze behind Neylan.